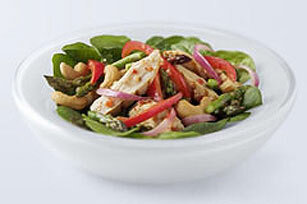 Italian dressing is the secret to a zesty, low-calorie chicken salad that takes just 15 minutes to prep. Pour 1/4 cup dressing over chicken in shallow glass dish; turn chicken to evenly coat both sides of each breast. Refrigerate 30 min. to marinate. Heat grill to medium heat. Remove chicken from marinade; discard marinade. Grill chicken 6 to 8 min. on each side or until done (165°F); cut into strips. Place chicken and vegetables on spinach-covered platter; sprinkle with nuts. Substitute 1 pkg. (6 oz.) OSCAR MAYER Deli Fresh Grilled Chicken Breast for the sliced marinated cooked fresh chicken. Drizzle the 1/2 cup dressing over salad before serving. Prepare using KRAFT Asian Toasted Sesame Dressing.